DermaLife K Calcium Free Medium Complete Kit is a serum-free, calcium-free medium that is made to order. Calcium Chloride has been omitted from the Basal Medium and is supplied as an individual LifeFactor. DermaLife K has been optimized for the culture of Human Keratinocytes, and supports their growth over at least 15 population doublings. DermaLife Calcium-Free Basal Medium does not include phenol red or antimicrobials. DermaLife Calcium-Free Basal Medium contains no calcium and will not support cell attachment and growth. Lifeline®calcium chloride supplement gives you the ability to vary the Ca+ concentration to meet your experimental needs. Recommended range of final calcium concentration is 0.02 mM to 0.15 mM, dependent upon cell type. 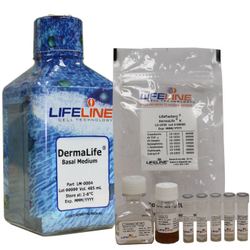 Add the LifeFactors® to promote guaranteed proliferation and function of cells. Kit format for formulation flexibility: Offered in a kit format composed of calcium-free basal medium and associated supplements and growth factors called “LifeFactors®.” This kit allows you to prepare fresh medium in your laboratory, extending shelf life and enhancing performance. Protective packaging: DermaLife Calcium-Free Basal Medium is provided in a light-protected 500 mL bottle. The LifeFactors® (growth factors and supplements) are packaged in a convenient gas-impermeable pouch for easy storage. This product is manufactured when your order is placed.